Color temperature is a characteristic of visible light that has important applications in lighting, photography, publishing, astrophysics, and surgical field illumination. The color temperature of a light source is the temperature of an ideal black-body radiator that radiates light of comparable hue to that of the light source. 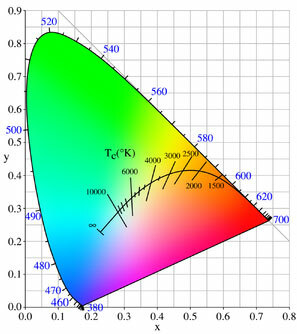 Color temperature is conventionally stated in the unit of absolute temperature, the Kelvin, having the unit symbol K.
Color temperatures over 5,000K are called cool colors (bluish white), while lower color temperatures (2,700–3,000 K) are called warm colors (yellowish white through red). In the dental operatory dentists more often than not, depends solely on the light emitted from the dental chair unit’s fitted overhead lamp for their field illumination. The over head lamps used by most manufacturers of dental chairs are high powered halogen bulbs which emit warm colored lighting [ 2700K -3000 K ] - ranging from yellowish white through red ! WYTELIGHT, a trademark LED lighting device developed by Wusten Purple’s research and development team, provides the operator with pure-white field illumination, which emits light with a color temperature of 6000 K. This is allows the operator to visualize the surgical field in its actual, natural color temperature. And this is of vital importance whilst shade-matching restorations, identifying cracks and craze lines, finishing margins etc. Several brightness measuring parameters of light are commonly or collectively known as intensity. These are obtained by dividing either a power or a luminous flux by a solid angle, a planar area, or a combination of the two. In simple terms, intensity is a direct measure of the brightness of the field provided by the light-emitting source. The lux (symbol: lx) is the SI unit of luminance. WYTELIGHT, a trademark LED lighting device developed by Wusten Purple’s research and development team, provides the operator with pure-white field illumination, which emits light with a luminous intensity in the range of 50000 Lux. The brightness provided by the over head lamps used by most manufacturers of dental chairs from high powered halogen bulbs is in the range of 300-400 Lux ! !